All animals need to balance the energy they can acquire and assimilate against the energy they spend and this balance exerts great influence on behaviour, ecology and reproductive fitness. Thermal constraints strongly influence energy balance for small-bodied mammals because of their rapid rates of heat loss and one objective of our work is to understand variation in the traits that help these animals maintain energy balance in the wild. We study variation in traits ranging from metabolic rate, use of torpor, activity patterns, habitat selection, dietary assimilation efficiency and other characteristics that help small mammals acquire or save energy. One example of a question we are interested in is whether long-lived species like bats exhibit greater within-individual flexibility than short-lived, non-flying mammals like shrews or voles. Flexibility and variability in physiology and behaviour may equip some individuals, populations and/or species to respond to human-caused environmental change more readily than others so this work has implications for conservation as well as for fundamental issues in ecology and evolution. 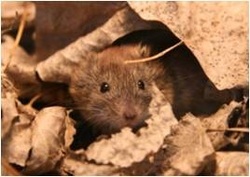 Small-bodied mammals, like bats, shrews and many rodents, are among our least-studied wildlife because of their secretive habits but they are ecologically important due to voracious appetites for insects (in the case of bats) or tremendous abundance (in the case of shrews or rodents). Understanding the ecology and physiology of these animals is important. Many species of mammals, including many bats, form cohesive social groups. Benefits of social living can include reduced individual predation risk, improved foraging success due to cooperative foraging or information transfer, improved offspring survival due to alloparental care and others. Many of these benefits apply to bats but, for temperate bats, perhaps the most important advantage of group living is thermal. Bats in groups save energy because large aggregations warm up a roost and because huddling reduces heat loss. Interestingly, the little we know of social networks in bats suggests they are similar in many ways to those of mammals as diverse as non-human primates, dolphins and hyenas, despite very different benefits. Also interesting, despite all the potential benefits of social living not all temperate bats form large groups. Two of the six bat species in Manitoba (hoary bats and eastern red bats) are entirely solitary and a third (the silver-haired bat) forms only small groups. These three species roost almost exclusively in trees, as opposed to buildings, and migrate south for the winter, as opposed to hibernating locally. Our three other species hibernate for the winter and, during summer, roost in buildings as well as trees and other natural structures. We are using a range of techniques from temperature radio-telemetry to monitoring of bats outfitted with passive transponders (PIT tags) to population genetics to help understand social behaviour and social networks, winter / summer movements, roosting habitat selection and the evolution of different overwintering strategies. Wind power has potential to help reduce our reliance on fossil fuels but one surprising consequence is the mortality of migratory bats. For reasons that are still not understood, thousands of bats are killed annually at wind energy facilities across North America, the vast majority during fall migration in August and September. Although mortality rates vary at different sites, some bat mortality has been documented at virtually every wind farm studied to date including sites in Canada. The migratory tree bats (hoary, eastern red and silver-haired bats) are most affected and, while we do not have good population size estimates for these species it seems unlikely that populations are large enough to sustain mortality rates on the scale that has been observed, especially given how quickly the wind energy industry is projected to expand. Bat mortality is of particular concern because of the very low reproductive rates of bats which mean their populations are fragile and slow to recover from disturbance. Although there is considerable interest in developing some kind of acoustic deterrent to repel bats from turbines this is likely impractical given the vast volumes of airspace from which bats would need to be repelled. However, encouraging for mitigation is the fact that most mortality occurs during only about 2 months of the year and may be predictable. Mortality rates appear to be highest at low wind speeds when the turbines generate very little energy. Therefore, shutting off the turbines on high risk nights may have great potential as an effective strategy that will minimise revenue loss for companies. With funding from the Sustainable Development Innovation Fund (SDIF) of Manitoba Conservation, we are studying bat mortality and activity at a wind farm in Manitoba. Mortality surveys confirm that mortality is happening in Manitoba and we are working to understand how to predict nights with high mortality risk in order to help devise a mitigation approach that will reduce mortality while also reducing costs for the industry. We are also testing one of the leading hypotheses to explain a possible attraction of bats to wind turbines. Our underlying objective is to contribute, with the wind power industry, to help ensure the sustainable development of an important natural resource while protecting ecologically important and fragile wildlife populations. White Nose Syndrome (WNS) was first discovered in 4 caves in New York state in 2006 / 2007 and had now spread to many more states and sites in the eastern U.S. andCanada. The little brown bat is most affected but IUCN-endangered Indiana bats have also been killed in large numbers. Mortality rates reach 100% in some caves (Blehert et al. 2008 Science) and best estimates suggest that more than a million bats in the eastern United States have already died making this perhaps the most rapid decline of any wildlife species in history. WNS is named for the cold-loving white fungus which grows on and in the skin of the face and wings of the bats. However, starvation during hibernation appears to be the cause of death as affected bats are clearly emaciated (Blehart et al. 2008 Science). Little is known about WNS but it appears to be spreading and it represents a potentially enormous threat to North American bat populations and ecosystems in general. Given the high mortality rates observed to date, the affected region may have already lost more than 1000 tonnes of annual insect biomass consumption. Data are lacking to address two key questions that are potentially important for understanding WNS: 1) what are the normal patterns of body temperature and metabolic rate for little brown bats during hibernation?and 2) how far do little brown bats travel between winter and summer. If WNS interferes with normal hibernation patterns it is critical that we learn what normal hibernation patterns look like for different populations across the very large range of little brown bats. A lack of knowledge about winter-summer movements is a major stumbling block for understanding the potential spread of WNS and our prospects for managing and controlling it. Some data from banding studies exist but our PIT tag work for the Manitoba Bat Blitz has the potential to provide a clearer picture. Thanks to grants from CFI, NSERC and other agencies we have several four or eight channel Sable Systems respirometry systems for measuring metabolic rates and evaporative water loss of animals and Lotek SRX-400 Datalogging Telemetry Receivers with antenna switching capability for “physiological telemetry” to remotely log body temperatures, and for traditional telemetry studies. We use a Pettersson D500x ultrasound recording unit or D240x time expansion bat detectors with Asus EeePCs or iRiver recorders for remote recording of echolocation calls of bats in the field. We mark bats with passive transponders (PIT tags) and have a range of equipment for recording PIT tag data from free-ranging animals. The lab is equipped with nets and traps for capturing bats and small mammals and instruments for measuring morphological traits, sampling blood and tissue and hand-held telemetry receivers for routine radiotracking. The “Batmobile”, our 4WD gas-electric hybrid field vehicle and cargo trailer gets us from place to place in the field.